What Are The Temperature Limitations For Refrigeration Cycle (Reversed Carnot)? Even though the reversed Carnot cycle is impossible, here it is used to show the temperature limitation of the Refrigeration cycle. From above equation, the COP of refrigerator can be improved by either decreasing higher temperature T2 or by increasing lower temperature T1. Due to certain functional limitation, these temperatures cannot be varied at will. 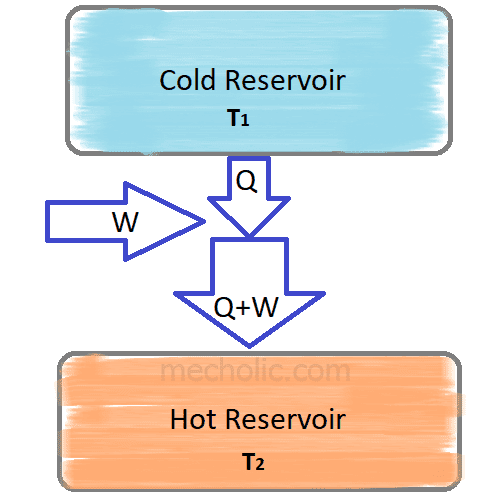 In refrigeration cycle heat is absorbed from the substance to be cooled and reject at cooling water/air. The heat transfer takes place in the right direction only when the lower temperature less than the temperature of the substance to be cooled and higher temperature is more than the temperature of cooling water. Why is COP of Carnot refrigerator in winter higher than the COP in summer? According to the equation of COP, if temperature cooling water or available heat rejection is low, the COP will be high. In winter season the temperature of cooling water T2 is low, so the COP will be higher. Similarly, in the summer season the temperature T2 is greater than that of in the winter. So the COP of refrigerator in summer is less than COP in winter. I.e. the Carnot refrigerator works more efficiently in winter than in summer. Why is the Carnot COP of domestic refrigerator less than that of domestic airconditioner? From above equation of COP, at constant higher temperature T2, COP of refrigerator increases with increasing lower temperature T1. Generally, for refrigerator the T1 is around 0°C and for airconditioner, T1 is around 20°C. Since T1 for airconditioner is greater than that of refrigerator, the COP of airconditioner is higher than that of the domestic refrigerator.